I am not one of those people who rolls their eyes at a good sandwich recipe. And no, I do not need instructions for how to make a sandwich. But I love suggestion, innovative or perhaps just less obvious flavor combinations, another person's take on a dish everyone has mastered seemingly from birth. Plus, and this is important, I'm marrying a Norwegian (in less than a week, I might add). Let me explain, from the beginning. I come from a long line of food appreciators. Perhaps not cooks all of them, but definitely a group of people who love to eat, love to try new things, just love food. Especially my dad's side of the family. One of the first times my father met R, they used a nearby street fair as an excuse to escape the shopping my sister, mother and I were doing. And my dad's first question once he had R alone? "So what do you eat in Norway. What would you call your national food." R looked right at him, and replied simply, matter-of-factly, "Sandwiches". Not lefse, not lutefisk (although honestly if I were Norwegian I'm not sure I'd admit to that stuff either), not brunost. Sandwiches. Of course, he was thinking about what he ate on a daily basis in Norway, and what he meant were those open-face sandwiches, often on cracker breads like Wasa, topped with cold cuts, cheese, fish sometimes, vegetables, cream cheese, tiny little shrimps, the list goes on. And it's true, that really is part of the bread and butter (if you'll allow me the indulgence) of day to day eating. In the mornings, Wasa topped with a slice of ham, some cheese, sliced tomato and cucumber. A surprisingly delicious breakfast, actually, filling and healthy. Or brunost, also sitting atop that same Wasa, complimented by a smearing of strawberry jam (oh yum). We North Americans aren't bad at the sandwich either, by the way. And the two following recipes, from Angela Tunner's Simply Summer, prove that a little inspiration and creativity can lead to bliss between two slices of bread. The balsamic onion recipe makes more than you'll use, but it's nice to have around. in fact, I used the leftovers to prepare the chicken and brie sandwich for a picnic in the park with my very-soon-to-be in-laws. And even the Norwegians were impressed. Set a large skillet over medium high heat and add the butter. Allow the butter to melt and bubble, then add the onions and stir to coat them with butter. Sweat the onions for about 5 minutes until they turn glossy. Add the rest of the ingredients and stir to coat. Reduce the heat to low and cook the onions for an additional 15-20 minutes, until softened, stirring occasionally. Preheat your oven or toaster oven to 350 F. Drain the tuna, but leave it slightly wet. Put it into a mixing bowl and mix it together with the lemon juice, the mayonnaise, tarragon, chives, sea salt and pepper. 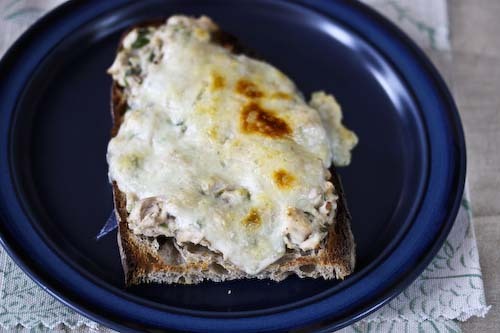 Spoon the tuna onto each of the 2 bread slices and top with the cheese. Heat in the oven until heated through and the cheese is melting. I also gave it a few minutes under the broiler to brown the cheese. Enjoy! Delicious sandwiches, balsamic onion sounds so good. To be honest I had no idea what Norwegians ate, now I know! 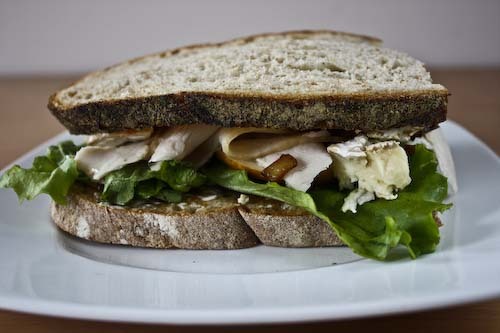 The chicken and balsamic onion sandwich sounds amazing! Hands down Americans make the best sandwich combinations ever (well at least what comes to mind when I think of a sandwich). Continental Europe loves this baguette with butter and one slice of ham and one slice of cheese. You barely need to open your mouth! I love the over the top sandwiches with all the fixins'. My husband is Norwegian and he loves the dark rye crackers with the little shrimps! He's absolutely Americanized though and wraps his lefse with hotdogs and gobbs of ketchup. Though I know he is truly Norwegian because he can eat slice after slice of brunost ( I can't stomach the stuff). That chicken and brie sandwich with balsamic onions sounds so good!